Angeliki Konstantinidou joined the Centre for Ethnic and Migration Studies a PhD candidate for the ERC-funded project “Migration, Transnationalism and Social Protection in (post-) crisis Europe”, under the supervision of Jean-Michel Lafleur. Angeliki completed her MA in Political Analysis (2014) and her BA degree (2011) in Political Science at the faculty of Law, Economy and Political Sciences of the Aristotle University of Thessaloniki in Greece. She was also a visiting MA researcher at Instituto Superior de Ciências do Trabalho e da Empresa- Instituto Universitário de Lisboa (ISCTE-IUL) in Lisbon, Portugal. 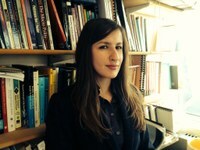 Prior to CEDEM, she worked as Research Assistant at the University of Leicester for the international project “Pathways to power: the political representation of citizens of immigrants origin in eight European democracies” and, in parallel, as a coder for the ERC- funded project “ResponsivGov: democratic responsiveness in a comparative perspective”. Before her position in Leicester, she was an MA student researcher for the Comparative Candidate Survey and Hellenic Voter Study conducted by the Laboratory of Applied Political Science of the Aristotle University of Thessaloniki. Her interests include social protection, comparative politics, international migration, political participation, political representation, integration policies for immigrant-origin minorities, party competition.